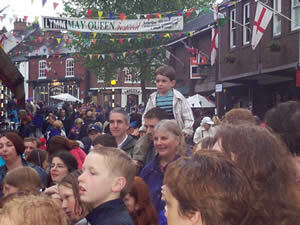 The village centre was a sea of umbrellas, however the weather had not put people off supporting the Food Festival. The Chinese Lion Dancers weaved their way through the crowd of people who were tasting various array of foods on offer provided by the local restaurant proprietors. The street entertainment took place at the Lower Dam provided by Cherry Tree, Oughtrington, Lymm High and Statham schools. The Bread and Butter Theatre Company presented the famous comedy show 'Retro TV' using volunteers to join in the entertainment looking at events over the past 2000 years. Many children enjoyed having their faces painted and could listen to stories in Story Corner. The Bulls' Hitters concluded the evening keeping the carnival atmosphere, which continued into the local hostelries after 8.30pm!